Dilaudid is a brand name of the potent semisynthetic opiate hydromorphone. As the name suggests, it’s a form of Morphine and hence an opiate. In legal terms, it’s classified as a narcotic. Currently, they use Dilaudid as well as Oxycodone to treat moderate to severe pain. This is often in patients where other painkillers (including other opiates) have stopped working. It is commonly prescribed to treat post-surgery pain. in addition, they may prescribe it to treat chronic non-cancer related pain. Is it addictive? What are the Dilaudid addiction signs and symptoms to look for? Is there help? Let’s find out. Other brand names for the drug include Exalgo, Dilaudid-5, and Palladone. Hydromorphone is such a potent analgesic that the state of Ohio approved its use in 2009. They use it as a backup measure for conducting state executions. This is when other drugs fail to produce a lethal injection. 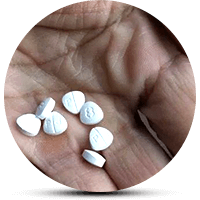 With systematic use, users of the opioid hydromorphone are prone to form a physical dependency on the drug. Dilaudid acts on the central nervous system’s μ-opioid receptors. As a result, it produces analgesia effects, primarily by reducing pain. With regular use, the central nervous system adapts its functioning. This is to accommodate the drug as the body compensates for the fine balance in brain chemistry necessary for normal functioning. When the CNS has completely adapted to the presence of the drug, the user is no longer able to function normally without it. As a result, one can classify them to be drug dependent. The company gives a black box warning against physical and psychological dependency on Dilaudid. This is in the product monograph included in the drug’s packaging. Have you developed a physical dependency on Dilaudid? Have you acquired a tolerance for the drug? Then, carefully consider the possibility that you may became an addict. Long term users of opiates are at a very real danger of substance addiction. However, what are the Dilaudid addiction signs? Are you trying to understand whether a person has become drug-dependent or whether a drug addiction has occurred? Then, consider the physical signs and symptoms with behavioral changes. In some cases, withdrawal itself is one of the indicators of an opioid use disorder. However, one needs to consider various other factors before one can establish an addiction. The DSM-5 (or Diagnostic and Statistical Manual) expands on how doctors check for dependency. Furthermore, it shows where dependency has crossed over into addiction. In most cases, the previous DSM-IV made a clear distinction between opioid dependence and opioid abuse. However, the updated medical understanding of the relationship between these distinct conditions now factors in the complex nature of dependency and addiction. If any of the above are so severe that it requires medical treatment, it could be an indicator of an opioid use disorder. The main distinction between the use and abuse of Dilaudid resides in the patient’s relationship with the substance. As a result, it may be a way to tell some Dilaudid addiction signs and symptoms. Sometimes, more than one of these signs are present in the user’s behavior. Are any of the symptoms op opioid withdrawal present? Is it necessary to take Dilaudid to avoid withdrawal? Have they failed in an attempt to quit or a persistent desire to quit Dilaudid? Are they using the drug for a much longer period than the original script specified? Have they increased the dosage substantially since the original script? Are they using Dilaudid more regularly than prescribed? Is the user experiencing cravings for the drug? Does using Dilaudid impact negatively on the user’s career or personal life? Are they using Dilaudid in spite of the problems caused by personal relationships? Have they bought the drug from illicit sources or via the internet without a script? Are they using another patient’s script to fill a prescription? Is Dilaudid used by smoking or snorting it, or any other way that isn’t prescribed by a doctor? Have they ever used the drug in potentially dangerous situations, for instance, while driving? Does the use of Dilaudid cause the user to spend less time at work or social or recreational activities? The past two decades have seen a massive increase in the use of prescription opioids. In fact, it has more than quadrupled – even though there is no corresponding increase in the use of heroin. Health experts attribute this phenomenon to the now widespread availability of these drugs online and via the normal healthcare channels. Sometimes, one opioid gets recalled or becomes commercially unavailable. Then, users simply find a replacement under a different brand name or a chemically similar composition. Do you or somebody you know show any of the Dilaudid addiction signs and symptoms? Recognizing the addiction is the first step to recovery.